A small dinosaur, upon drawing his last breath before dying, attempts to cope with the traumatic experience, namely the cataclysm caused by the meteorite, which led to his demise. 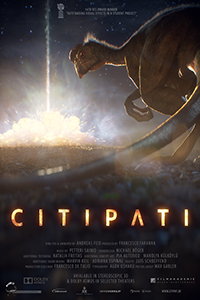 This film, which is also my graduation project at the Filmakademie Baden-Wuerttemberg, is fully CG-animated stereoscopic short, created primarily in 3ds Max & Nuke. The dinosaur, complete with procedual rigging, muscle deformations and hair simulations had to be animated under a very tight schedule, occasionally up to 30 seconds per week. On the other hand, the extensive amount of effects simulation work was handled using a combination of rigid bodies, dynamic particles and fluids, which totaled to over 300+ FX simulations throughout the entire short. Most of the creative choices were put directly into the compositing package, making extensive use of multi-channel renders, data channels and custom made node groups. Some shots contained over 4500 nodes in order to handle over 320 render elements, multiplied twice for the stereoscopic renders.